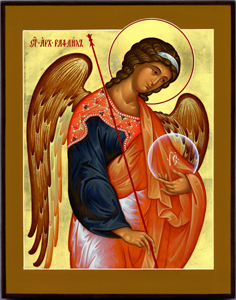 The Holy Archangel Raphael is an angel whose role is that of providing healing to the earth and to its inhabitants, hence his name whose etymology is Hebrew-Rafa’El, and meaning is "It is God who has healed ". He is celebrated, by the Church, primarily on November 8, the Synaxis of Michael and all the Bodiless Powers of Heaven. He cares for the convalescence of the ill, serves as the unseen guide for those who are travelling diligently with important chores and furthermore he is the protector of weddings and conjugal love. The Holy Scriptures make mention of the Holy Archangel Raphael in only one place, The Book of Tobit. The Book of Tobit relates the story of two Israelite families that had been constrained during the reign of Enemessar to settle in Assyria, away from their homeland of Israel. One of these families belonged to a righteous man, a descendant of Nephthali named Tobit who together with his wife, Anna, and son, Tobias, had been confined to the ancient Assyrian metropolis of Ninevah, whereas the other one belonged to a man named Raguel who had settled in Media, in the city of Ecbatana. Having been reported to the Assyrian usurpers that he had taken and buried without any official consent the bodies of his Israelite compatriots whom the foreign authorities had sentenced to undergo the capital punishment, Tobit had fled from Ninevah and returned only after the assassination of Sennacherib, the current emperor. Under the reign of Sarchedonus, the son and successor of Sennacherib, Tobit had been absolved of his ban from Ninevah and all his goods had been restored to him and his wife and son freed, owing this to the influence exerted by his brother, Achiacharus, whom the new emperor had appointed second-in-command and entrusted with supervising over the affairs and well organization of the empire. Tobit, however, outraged his Ninevite neighbours once again by burying without any official permission, as he did before, the body of an Israelite who one night had been murdered in the streets. That same night, after he had interred the body of his Israelite compatriot, Tobit had slept outdoors in the courtyard of his abode near a wall in which sparrows had made their nests. As he had been sleeping, the bird dung of the sparrows had fallen on his eyes causing him thus to lose his eye sight. Bereft of eye sight and weakened by old age, Tobit was now demoralized and felt that he would perish soon. The situation of the other family, that of Raguel, was no less disheartening since Sara, his daughter, was in serious torment as she was being haunted by a jealous demon called Asmodeus that had murdered all of her seven previous husbands while she had been with them the night following their wedding; no sooner had she become a wife than the demon murdered her new spouse. Because of their financial troubles, old Tobit decided to send his son, Tobias, to the Median city of Rages so that he might retrieve ten silver talents that had been entrusted to the keeping of a man named Gabael, the son of Gabrias. Before letting his son commence his journey, Tobit encouraged him to never lose confidence in God’s mercy and emphasized the usefulness of almsgiving. Tobit assured his son that helping the poor and providing them with comfort in their time of need is useful to the salvation of both the benefactors and the departed in whose name the alms are being given. Tobit also insisted that his son should embrace wisdom and moderation in word as well as in deed and avoid indulging pleasures that might cause him to fall victim to excesses such as lust and drunkenness. What’s more, he was exhorted not to marry any pagan woman lest he should dishonour his Israelite ancestry. Having concluded his lecture, Tobit recommended that his son should employ a trustworthy person as companion for the journey. Tobias followed his father’s recommendation and set off to find an honorable man and ultimatelly he found the Holy Archangel Raphael, whom God had sent to aid Tobit and his household, but because of the human appearance that was concealing the Archangel’s divine nature, Tobias could not see that the person whom he had chosen for a companion was in fact an angelic being. After he had been presented to Tobit, Raphael was asked for his name and if he was an Israelite, to which the Archangel replied that his name was Azarias and that he was the son of Ananias the great and consequently belonged to the people of Israel. Old Tobit rejoiced upon hearing this answer and took the opportunity to reminisce about the time when he had been to Jerusalem and remained impressed by Ananias’ willingness not to adopt any pagan conviction. Tobit praised Ananias’ orthodoxy that came in contrast to the numerous erroneous convictions and rituals that the other Israelites had adopted from the foreign invaders, after which he congratulated Raphael for his alleged ancestry and concluded that Tobias had made the right choice in employing Raphael as companion. While on their journey to Media, Tobit and Raphael stopped to spend the night near the river Tigris. When Tobit went to bathe in the river’s waters, a large fish leaped out from the waves and attacked him. On Raphael’s command, Tobit grabbed the fish and brought it to the hearth. Before they roasted the fish, Raphael had Tobit disect it and collect its heart, liver, and gall. The following day, after they had reached Media, Raphael decided that he and Tobias should go and lodge with Raguel. The Archangel encouraged Tobias not to be afraid to marry Sara, and assured him that the demon that had murdered the seven previous men whom Sara had married would be banished and not harm him in any way. Additionally, Raphael pointed out that Tobias would do honor to his Israelite lineage, as Tobit had requested of him, by marrying Sara since she too pertained to the people of Israel. On hearing this, Tobias fell in love with Sara and subjected himself to Raphael’s advice. Following Raphael’s instructions, Tobias took the liver and the heart of the fish that he had caught the other day and as soon as he and Sara, whom he had married that same day, had entered the wedding chamber, he laid the fish’s remains upon some perfumed powders and burned them. Not being able to resist the odor and smoke coming from the fish’s burnt viscera, the demon left Sara and fled to the distant lands of Egypt, where Raphael caught and bounded it lest it should return and foil Sara or anyone else ever again. The newly wed couple then made a prayer before God and thanked Him for granting Sara to be eliberated from the demon, after which Tobias and his new wife lay together in bed until the break of dawn. Raguel, being ignorant of what had happened in the wedding chamber, had started doubting that Tobias was alive, and he even had one of his servants dig a grave in which to bury his new son-in-law should the demon have murdered him as it had done with the previous men whom her daughter had married. These doubts, however. intesified Raguel’s mirth later on, for he rejoiced greatly upon seeing Tobias safe and sound and his daughter delivered from the demon’s torment, and commanded that the wedding feast should be prolonged to fourteen days. As he was obliged to remain in Raguel’s home during the entire duration of the wedding’s feast, Tobias asked Raphael to go without him to the city of Rages and recoup the ten silver talents that had been entrusted to Gabael. The Archangel successfully retrived the ten silver talents and brought them to Tobias, and the two commenced their journey back to Ninevah immediately after the wedding’s feast had ended. As soon as they had arrived back home, Tobit and his wife, Anna, were overwhelmed with joy to see them for they had assumed that something bad had happened to them on their journey due to their two-week-long absence. But their joy would not end there, for Tobias, following Raphael’s instructions, took the gall of the fish and rubbed Tobit’s eyes with it and as soon as he had finished doing so his father regained his eyesight and could see again. Having finished saying this, the Holy Archangel Raphael disappeared, and Tobit and his son could see him no more. Another possible appearance of the Holy Archangel Raphael can be seen in the Gospel written by John, where the Apostle makes mention of a pool called Bethesda in which an angel of the Lord descended and bathed regularly, conferring to it healing properties that restored the health of the first person to bathe in it after the angel had moved its water. Although the name of the angel is not mentioned, the fact that he is associated with healing makes it plausible that he may very well be the Holy Archangel Raphael mentioned in The Book of Tobit. This page was last edited on June 5, 2011, at 18:40.